You can just barely see the turquoise colored egg between this Great Egret pair’s feet, under the neck of the bird on the right. All they can do now is wait. He did bring a few more sticks for the female to poke around before she laid back down. I’ll be checking back regularly looking for chicks. Lovely shot and scene, so full of detail. Thank you, Belinda. I was pleased to capture this pair with only a few branches interfering. 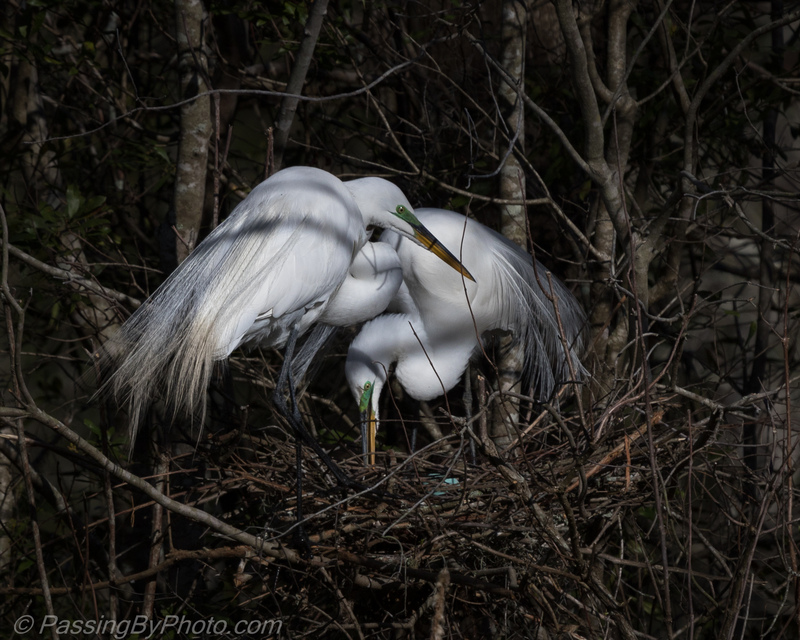 Most of the Great Egret nests are more tucked into the trees. Thank you. It will be interesting to watch as the eggs incubate and then hatch. Thank you, Inger. Hopefully we’ll see chicks in a couple of weeks. Thanks, Donna! It was cool to see. Most of the heron and egret nests are up too high to see what is going on.